For over a quarter of a century, Navajo silver and goldsmith Jimmie King, Jr. has excited the imagination of jewelry lovers. His unique style of heavy metal work and delicate inlay has gained him a reputation as a master jeweler. His work is a combination of strength and delicacy. The most common reaction when people first pick up a piece of his work is to comment on the weight of the jewelry. It feels substantial. It is inlaid with a precision and color awareness that marks it as King's alone. King is particular about his work, refusing to hurry a piece and willing to melt it down if he is not satisfied with the final result. Every piece is hand built and finished. The artist lives and works just off the northern edge of the Navajo reservation near Farmington, New Mexico. He is well-read, always taking time to learn new things, and listens to opera music as he creates his jewelry. King is the creator of the inlay cube, the solid link bracelet with inlaid clasp and the "Sky High" bracelet. 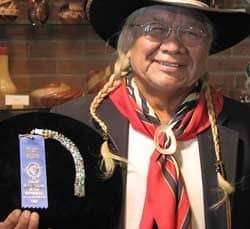 He has won top awards at the Gallup Intertribal Ceremonial and has been featured in several books and magazines about Native American art. His jewelry is signed in cursive "JR" for the first and last initials of his name. Six dots in a semi-circle above the letters stand for the six sacred directions: North, East, South, West, the Sky and the Earth. Years ago, in a ceremony, a medicine man told him that if he put these dots on his jewelry, everything would go well for Jimmie - it appears he was right.